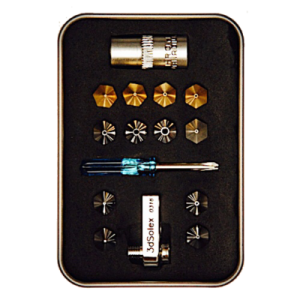 7 Matchless nozzles (0.25mm, 0.4mm, 0.6mm, 0.8mm, 1mm, 1.5mm, 2mm! Whatˋs this? – This upgrade significantly decreases printing time. If you can live with a lower resolution in some prints, you can save 75% printing time (4x increase in plastic output), A 16h print (UM2) finishes in 4h (Matchless Upgrade, 1.0mm + RACE nozzle compared to 0.40mm. 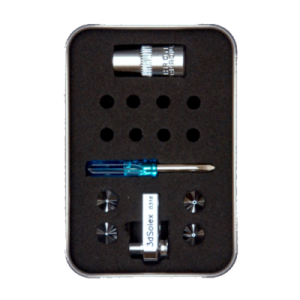 Needs 35W heater (standard in UM2+). 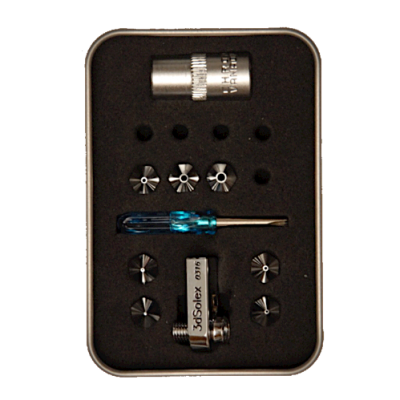 – 1.0mm Matchless RACE nozzle * settings: 1.0 x 0.5 x 60 = 30 cubic/sec These are minimum results if your UM2+ is correctly configured. You will be able to find your own settings/favourite relation of speed,layer, nozzle and increase from here! PRINT FASTER, OR PRINT COOLER! 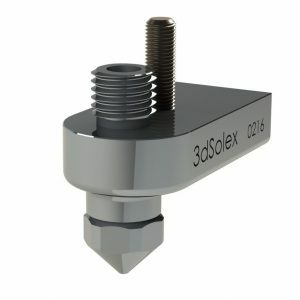 – 40% more contact area between heater block and nozzle! * We have reached the limit of the UM2+ CPU. With for instance the Bondtech.se – feeder you will print so fast that it starts making square circles. The CPU itself cannot issue commands fast enough!